You can't be in New York City right now without noticing its newest food craze: ice pops. Whether its a Mexican mango-chili popsicle on the highline or a red plum shaved ice cup from People's Pops, gourmet ice-pops are making their mark in NYC this summer. Of course, I am thrilled! Not only does this give me an excuse to eat one more frozen delicious treat a day (I could live off a diet of ice-cream in the summer), but icepops are a wonderful way to use fresh summer fruit from the farmers market, and serve as a refreshing, healthful alternative to an ice cream pop. 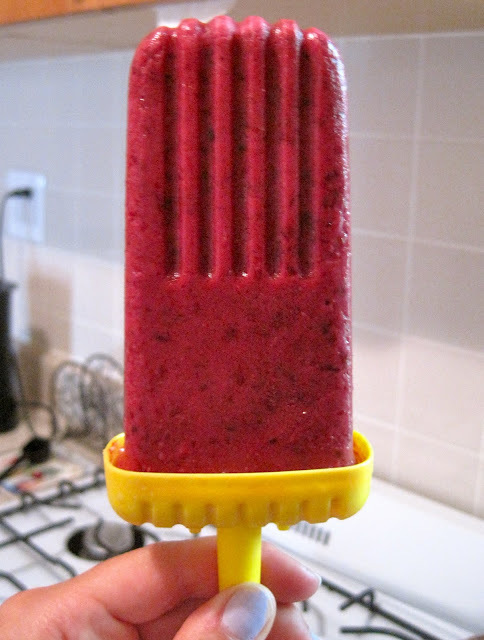 I used Epicurious's Blackberry, Honey and Yogurt Pops recipe but experimented with blueberries and strawberries in addition to blackberries, hence the title of my recipe: Berry, Honey and Yogurt Pops. The yogurt and honey add a fragrant Greek flare to the fruit, plus give the popsicles some protein so the snack can fill you up to avoid "empty calories". A tip for all kvellers out there that I learned the hard way: don't wear white while making these!